Fishing is an active sport spent in the open air and it can be pursued throughout all the seasons. Fishing is an unpredictable experience interacting with nature and no two fishing trips are ever the same. Fishing is that extra step from pond dipping for tadpoles and sticklebacks and all those other similar childhood memories that are wrapped in cosy nostalgia. 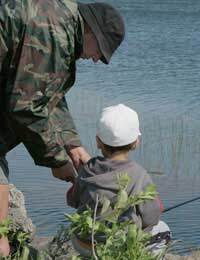 And fishing provides the perfect opportunity for adult and child to spend quality time together. Every person of twelve and over must have a rod licence before going fishing. Licences can be obtained from post offices and also purchased on line by visiting the Environment Agency website. There is no need to buy state of the art equipment for a child's first fishing trip. Keep the tackle simple and inexpensive. Choose a short spinning rod because this type of rod can easily be handled by a young person and fit it with a fixed-spool reel. Fixed-spool reels are easy to operate and rarely produce tangles with the fishing line. Let the child choose some of the tackle because it's important they make a contribution. Chances are they will select the largest and brightest float in the shop....the kind of float that is designed to warn ships of shallow water....but it doesn't matter because their decision needs to be valued. Fishing guides are produced for each area of the country and they have information about where to fish locally. These guides contain lists of lakes, ponds, reservoirs and fisheries and they also explain what fishing methods are permitted. There are details of day and weekly permits as well as the species of fish likely to be caught in each venue. These fishing guides are available at libraries and Information Centres. They can also be downloaded from the Environment Agency website. Most tackle shops will have information about where to fish locally and the cost for day and weekly permits. There is a well known saying that states "first impressions count" and this applies to the first time a child is taken fishing. The day has to be enjoyable, memorable and hopefully the beginning of many others. So pick a day when the weather promises to be kind and don't plan to go out for a mammoth session. Pack a picnic and consider the outing as an adventure where catching a fish will be a bonus. Having a pair of binoculars would be useful for spotting birds and other animals. How about a camera for recording the occasion? Take a plastic bag for collecting souvenir finds of feathers, leaves, animal fur and whatever else sparks the child's curiosity. Find a place where the fishing is easy, like a pool or slow moving water, and keep the technique as simple as possible by using a float or small leger. Begin casting in a swim where you know there will be minnows or shoals of fry and a catch almost guaranteed. That first caught fish, regardless of size, will be remembered for a long time and just could be the "hook" for future visits. Don't make the initial trip too serious or too long after all you've taken the child fishing for their sake and not to accompany you. Don't force a child to go fishing because they will end up going just to please you. Praise every cast, strike, and every bite on their tackle. It really doesn't matter if they shuffle, bang their feet or move around all the time because that's what a child does....it's natural behaviour. Encourage them to assemble the tackle as best they can and always in their own time but perhaps handling bait and fish could be left for another time. Even though the environment might be familiar always be aware of the potential dangers of water. There's one essential aspect of getting children happily involved in fishing....they are the future of angling! where in East Anglia is a good place to start to practice and teach my 6 year old girl to spin fish (lure angling style)?Thank you in advance. Charlie.